This report was prepared for the Ontario Ministry of Citizenship and Immigration. It presents the final results of a year-long project that examined the use of three evaluation tools for capacity building projects in the not-for-profit sector. Based on the experiences of the participants and evaluators, the paper presents key learnings for future capacity building efforts in the sector. In 2010, the Partnership Grant Program (PGP) of the Ontario Ministry of Citizenship and Immigration invested $7.2 million over three years in the capacity of 27 not-for-profit organizations. The goal of program was to enable organizations to engage in activities to strengthen the sector’s networks and collaborative capacity, as well as to improve responsiveness to clients, communities and stakeholders. 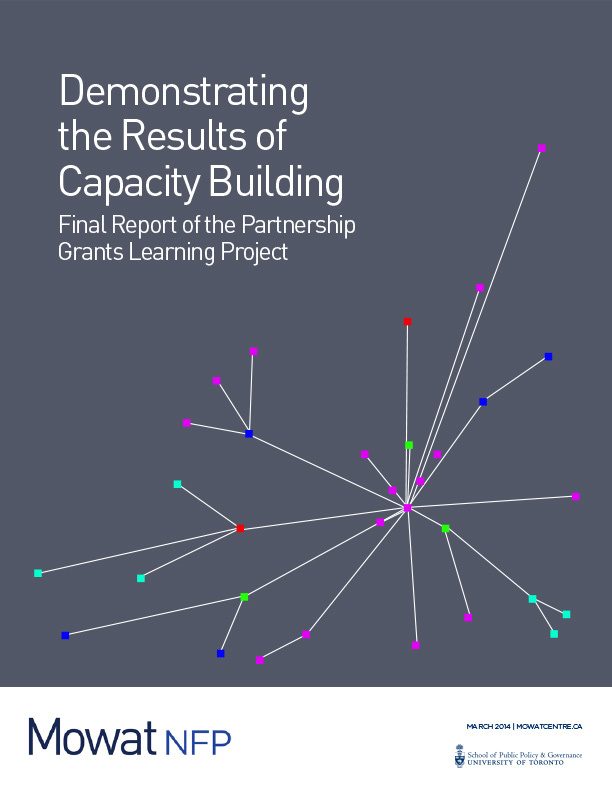 The Partnership Grants Learning Project (PGLP) was an experiment in the application of three evaluation methods (Most Significant Change, Network Mapping, and Outcome Harvesting) to this group of capacity building projects. The learning that has developed as result of the PGLP has the potential to improve the capacity building work that organizations undertake, strengthen their ability to demonstrate results and share learnings, and help funders to understand how to better support capacity building in the not-for-profit sector. » Results from the process are reviewed by capacity building theme with an analysis of how the evaluation tools were useful, individually and in combination, in capturing these results. Based on the experiences of the participants and the evaluators, this paper distills the learning for future capacity building in the sector. Key learnings from the process include the importance of having an evaluation framework, the value of strengthening the capacity for evaluation within organizations, the importance of ownership in the process, and the adaptation and application of the tools themselves. In addition, there were key learnings around the results of the projects. Using these evaluation tools, PGP grantees were able to demonstrate increased and strengthened relationships with key partners, including relationships across sectors, pointing to the growth of networks and social capital within the sector. There were also several examples of collaboration that were identified through the process that point to an increased level of engagement between organizations and an increase in the ability of organizations to respond to and act on opportunities that strengthen their missions. As well, there were outcomes identified through the process that demonstrated increased capacity for strategic planning and delivery on mission. Taken together, these developments signal an overall increase in the capacity of PGP grantees. This capacity results in better engagement with stakeholders, clients and partners; enhanced outcomes for collaboration; and strengthened delivery on mission.